Searching and choosing interior finishes for your house is not an easy choice, especially as there are plenty of deals on the market. The main criterion to consider is the quality of the materials. That's why, instead of rushing to inadequate materials, it's better to think twice for taking the best decision. It is important to choose a material that is a perfect blend of many qualities: to be a unique, durable, and always trendy material. Natural stone meets all these qualities, being an excellent choice. Each piece of natural stone is a unique blend of colors and tones, thus making your home completely personalized, unlike artificial materials, with all pieces used for finishing identical and without personality. Natural stone has a unique character, being durable and majestic at the same time. The finishes made from this material are always stylish and can never risk of bringing kitsch into your home. In the case of ceramic tiles, this can happen very easily, especially if you choose a flashy color, which is not the case with natural stone. This is available only in delicate shades, with many options for decoration. Even if you want, you cannot be wrong, because these natural building materials will simply not allow it! 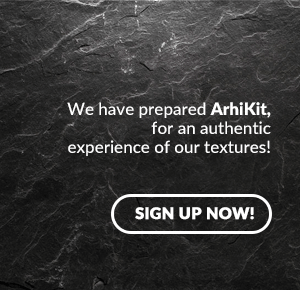 Whether you opt for granite, onyx, travertine or marble, their texture is perfect. Another great benefit of these materials is that they are ecological. And sometimes you can have the pleasant surprise that they will have lower costs compared to artificially produced materials, such as ceramic tiles! 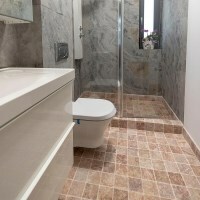 Bright living from a travertine-decorated apartment (PIATRAONLINE customer). Beyond the unique appearance, the special quality of the finishes attained with these materials is that they do not scratch easily, which can happen with ceramic tiles. Also, these materials are durable in heavy traffic areas, which means you can use them for hallway or the kitchen, areas with high-traffic in a residence. 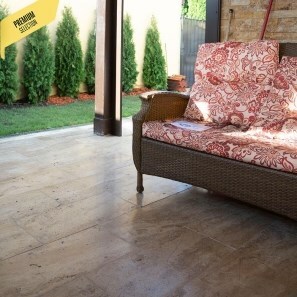 Unless you are afraid that they will wear out and lose their brightness, this can also happen to ceramic tiles. 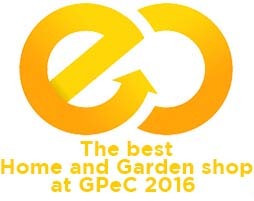 That's why you'll make the right choice by choosing the natural stone. You will get a modern-looking home, but also a classical note of a good taste. In terms of maintenance of these finishes, this does not require special attention, more than the attention you pay to surface care in artificial finishes. There are professional cleaning products for aftercare. Natural stone is also noticed due to other qualities: it can be used in combination with wood for creating an original decoration, but also very elegant and sumptuous for your home. The combination is ideal for the bathroom, the kitchen, the living room or the hallway. No matter what space you have, you can choose this original combination to make sure you will not fail. Such a design idea does not have the same impact if you choose the combination of ceramic tile and wood, because the room will not have a natural look at all, neither a welcoming one. So, for a welcoming, but unique, personality home, the combination of wood and natural stone is great. It is a solution that can be put into practice both in the apartments, but also in a larger house. Bathroom flooring should meet many qualities: it must be moisture-proof, with slip-resistant properties and durable. Above all these adds an important aspect: it must have a special look so that the bathroom does not turn into a dull, uninteresting room. How often are you tempted to choose for the wrong reasons: because a neighbor recommended it or because for example the ceramic tile can have a lower price compared to natural stone. But on the long run, you will lose. 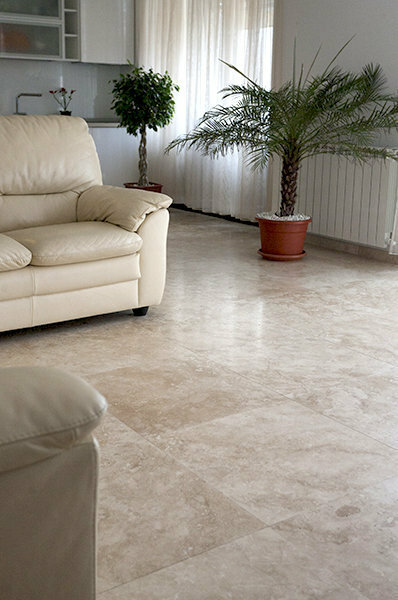 That's because no ceramic tile can be as durable as granite, travertine or marble tiles. You can say that these will last a lifetime and you will not have to make changes in the apartment every few years due to the wear of the finishes, as is the case with ceramic tiles. With the help of natural stone finishes, you can decorate your home by your own taste. Finishes can be custom-made, you can choose marble or travertine tiles to meet a particular requirement of yours, a benefit not possible with ceramic tiles. In our showroom you can find a lot of concept spaces and tile samples, so you can easily choose the suitable finish. 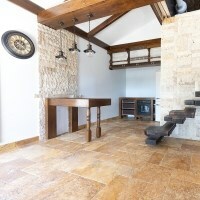 Travertine flooring in a neo-Romanian style house. Because you want the final look of the bathroom or the kitchen to be exactly as you have imagined, it is important to avoid mixing the materials. It is inappropriate to choose, for example, natural stone bathroom flooring in the bathroom (such as marble or travertine) and walls decorated with ceramic tile. Space must have unity and continuity and, at the same time, to be decorated with great taste. So you can also choose cladding the walls with natural stone tiles, such as marble. You can also use some decorative tiles, for a touch of originality. Natural stone finishes mean long life, easy aftercare, durability, qualities that far exceed the initial investment. And it can last a lifetime! 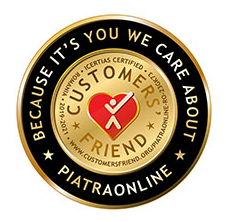 If you want to find out more about the natural stone best suited for your project, give us a call at +40318.222.333 or email at export@piatraonline.com.